This is the first in a series of blogs about by our experiences with the strangers who came to our home, and the gifts they brought. The motto “Beware of strangers bearing gifts” comes from the Trojan horse story, more specifically in some translations “Beware of Greeks bearing gifts.” I have the impression that contemporary thought often distills the phrase to simply, “Beware of strangers.” While I know there are broken and dangerous people in the world, and I have encountered a few of them, my overall experience with strangers has been nourishing. 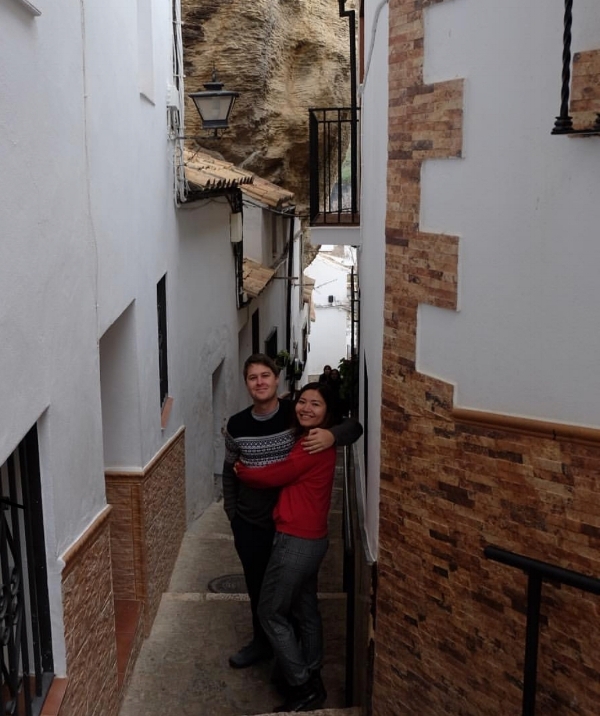 My attitude towards strangers is informed by the fact that since 2011 Daud and I ARE “the foreigners,” or the “giri” as known locally, here in Andalusia, Spain. 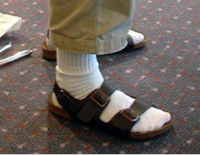 (I asked my friend Tatiana how “giri” actually translates, and the best she could do was “imagine an English person who is prone to wearing clunky sandals with socks.”) Thankfully, Spaniards meet us with seemingly boundless welcome and oft’ needed patience, and we believe the gifts we bear to Spain in return are benevolent ones. This experience fortifies our endorsement of human mobility in general. "Giri" sighting, explained a local. 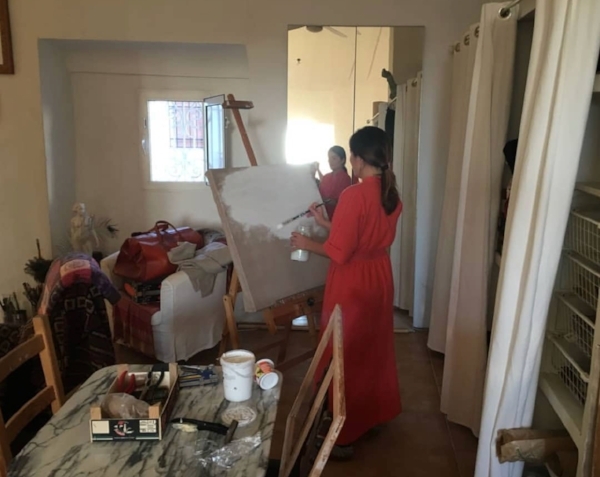 Apart from our own foreignness, a home in Andalusia has given us another reason to appreciate what strangers have to offer because of our participation in the website community www.workaway.info. This is a hub where travelers volunteer assistance of most any sort in exchange for room, board and cultural exchange. When inviting volunteers, of course one sorts and investigates possible matches in hopes of maximizing compatibility. But still, all participants are strangers to one another, and usually from different countries. The website would naturally self-sort for people who are adventurous. From our Workawayers I have learned many new skills, acquired new points of view, expanded my knowledge of other cultures and formed friendships. I want to share some of their stories, beginning with Dennis and Adisa. Dennis wrote to us on Workaway, remarking on the similarities between our lives. Not like us, Dennis is a quadruplet born in southern California, who while in grade school developed a love of maps of far away places. 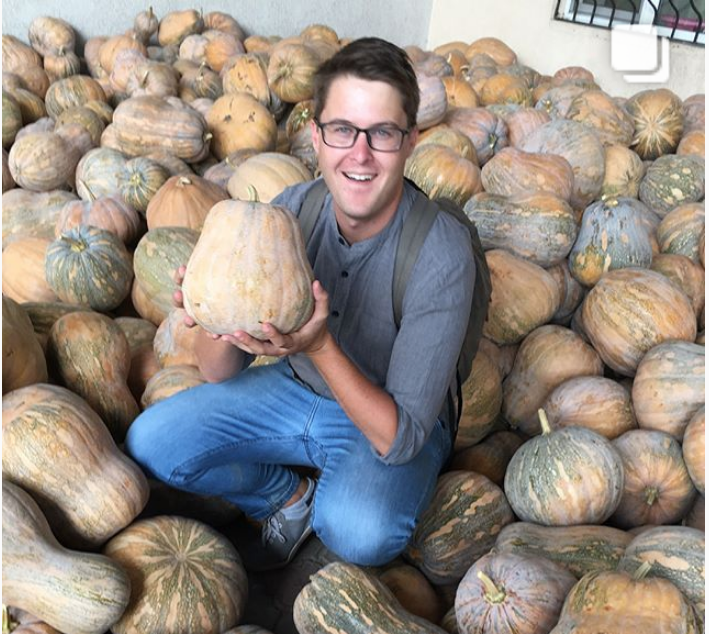 He found a high-school exchange program which permitted him to travel to Kazakhstan’s former capital, Almaty, and live with a family for a long stay. He fell in love with the place. Now in his early thirties, Dennis moved post-university to Almaty and married Adisa. So, Dennis pointed out in his initial letter, we are two couples, both with one American and one person born in Kazakhstan, whose lives have Russian/Soviet art in them and who love to travel. Not something that you meet every day. A creative powerhouse, Adisa is a native of Almaty. She is tiny, but athletic and energetic, with a 1000-watt smile and a command of English that would do an NPR radio journalist proud. She founded an English language school for adult entrepreneurs, where she herself is the rock star private language coach. She sings well, and learns with Dennis a song in the local language from every country she visits, which is not a short list. She married Dennis in a fully-traditional Kazakh wedding which was broadcast on national television, complete with sheep’s head and (not so traditionally) California in-laws. She is a keen observer of the cultural differences and similarities between her mixed-culture families, and a diplomat of the highest order. She’ll try anything, including starting Petalka , an craft cooperative for Kazakh women. She's won international grants to help them get their wares to market. I fell in love with Adisa as soon as her smile hit our town. After moving to Almaty, Dennis become a Kazakh television personality. (As you do…) When not filming episodes of “Discovering Kazakhstan,” he has a business conducting private walking tours of the former capital. www.walkingalmaty.com While doing all the walking tours he noticed a plethora of aging Soviet mosaics, stained glass installations, monumental sculpture and various other kinds of public art. He was naturally curious and wanted to tell his walking clients about the installations, but nobody local seemed to know much about the artworks, nor were many people interested. It was as if when rejecting the Soviet Union, the artwork was thrown out with the bath water. Some of the art installations were decaying. 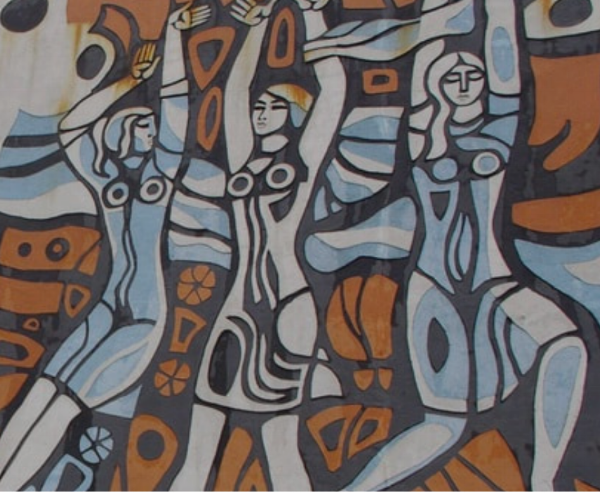 Dennis began a web archive of all the public art he could find in the city, posting photographs of the work, along with whatever provenance he could dig up. People are taking notice. The news, governmental and cultural entities in the city have begun to use www.monumentalalmaty.com as a resource. Denis has formed an alliance with a good gallery and a group of patrons who are backing an upcoming exhibition and the publication of a book about Kazakhstan’s public art. The website now has over 150 monumental art installations on record, and is growing steadily. Dennis has hired a dynamo research assistant to share the work load. Perusing the website, which I highly recommend, gives the impression of a city in love with decorative design, and an exuberant national creative spirit, resulting in many genuine masterpieces. 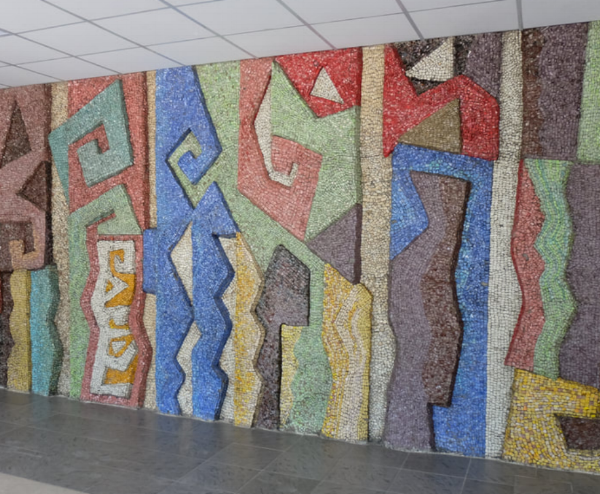 The monumental art of Almaty also is a beautiful document to the Soviet Union’s belief and investment in the power of public art, even if their purposes were ideological in addition to aesthetic. 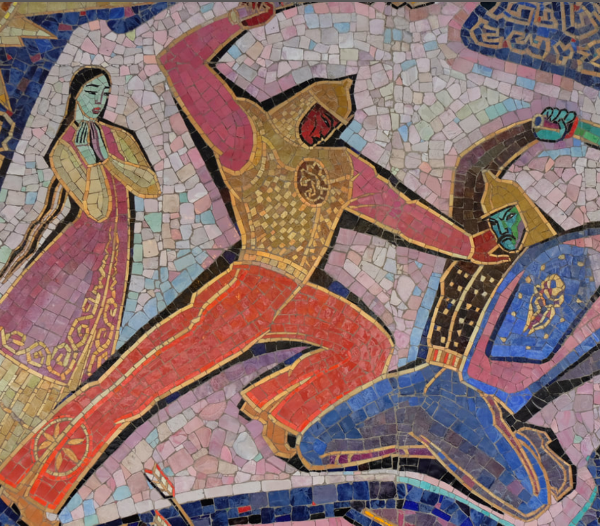 The artists were often Kazakhs, but there are artworks by other artists from all over the former Soviet Union, as well. 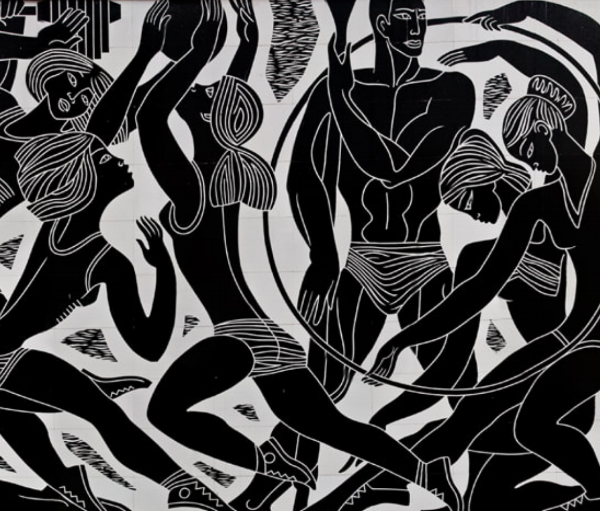 Dennis reports that a sense of ownership of these masterpieces is returning to the city, especially among the younger generation, and pieces are attracting preservation and restoration. He has become friendly with many of the now-elderly artists or their families. An American quadruplet who plays the ukulele is the catalyst for a Kazakh public art renaissance. Part of a six-month walkabout, this couple spent a month in our home. They made themselves useful in exchange for room and board, and they did so while infusing our home with a sense of joy. They made a spreadsheet of everything in the pantry and then created recipes to utilize supplies which could go to waste. They played music in the evening. They helped out by doing the grocery shopping, taking photographs we needed and stretching canvases. Adisa posed for paintings as well as Serithea scarf publicity photos. Their contribution to our home gave me back several hours a day to devote to painting. We shared a Christmas together I’ll never forget. Sitting around the table every evening we had informative conversations about mosaics and mosaic techniques in different parts of the world. Systems of art education. Films, lots of films. Methods of monumental art preservation. As we primed linen or mixed drinks, Adisa and I shared and compared our experiences as spouses who both have half a family from Central Asia and half a family from the USA. Adisa sat me down and showed me how to use Instagram, about hashtags and “stories.” One evening Dennis got out his Ukulele and convinced me to attempt to accompany them on my violin while he played Christmas carols from around the world and Adisa sang. I was not musically brilliant, but wow, was it fun. Dennis told us about consulting on a film we loved, “The Eagle Huntress,” and about hunting carpets in Kirgizia. At the end of their visit, Dennis gave us a walking tour of Olvera, in the style of his Almaty walking tours. What has stuck with me about this couple is how they steadily pursue their inquisitiveness and their dreams, and the surprising life path unfolding before them as a direct result. 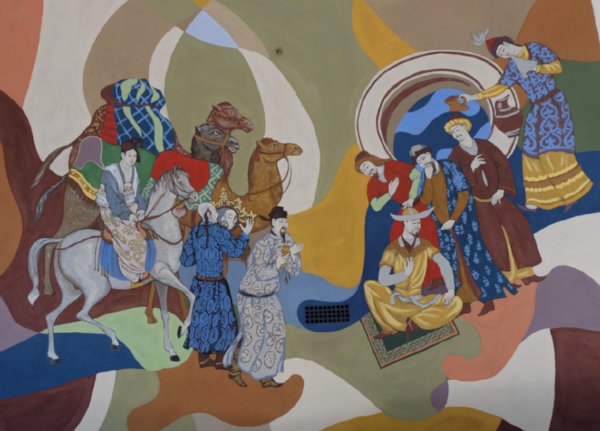 Because Dennis pursued his love of maps and wandering curiously on foot, he finds himself a documentary host working in the entertainment industry in Kazakhstan and catalyzing a public art rebirth. Adisa loves languages and meeting people, she now has her own school, skills in three languages, and an artists’ coop getting off the ground. They are an inspiration to me, and their boisterous attitudes fed my soul. They bolstered my sense of purpose about my work and the subjects which are dear to me, and they gave me much-enjoyed camaraderie as mixed-culture, mixed-religion families. I am deeply grateful to them. That's my story for today from my Spanish studio (where today I got a brand new skylight!!!! Whoohooo). I'd be delighted to hear about some of your positive experiences with strangers bearing gifts. With Ukrainian artist, Victoria Kalaichi, and her husband Denis Sarazin who's taking the photo, at the top of the Malaga ferris wheel. But that's a different story.